After Alyosha died last June, I was resolved to not have another larger dog for a long time. Turns out “long time” is around five months. I started thinking about adopting a “dog-sized-dog” again. (shhh, don’t tell Pugsly that she isn’t a big dog) That’s a big decision and we weren’t quite ready to take the plunge. Fostering critters is a great way to be helpful, but you also get the benefits of having doggie or kitty company without the long-term responsibility. Fostering critters is something I am quite familiar with so I decided to look to getting back into it. The Yavapai Humane Society had a number of dogs they were looking to find foster homes. 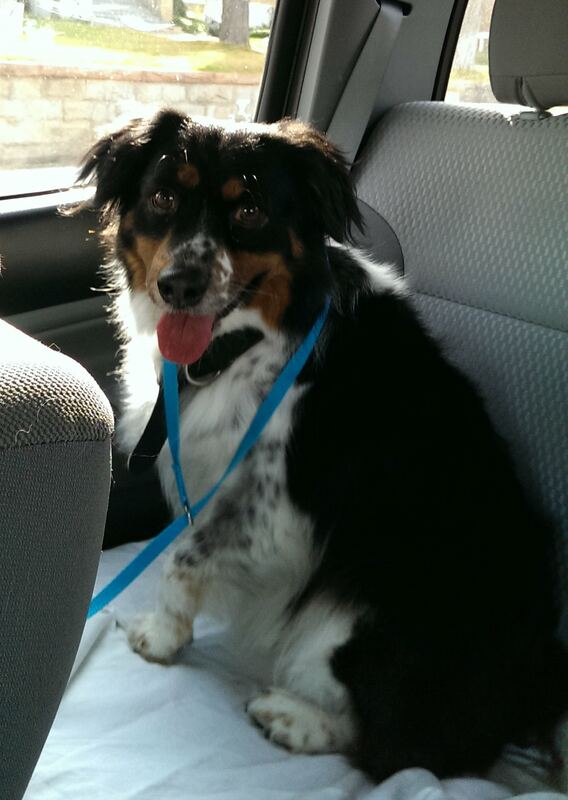 Our first foster was a smaller Australian Shepherd named “Buddy”. He’d been an owner-surrender and responded to that name. Buddy was high-energy, as Aussies usually are. A friend of mine had recently lost his old doggie fell in love with Buddy and adopted him quickly! After Buddy left, I got Wiggles. She was a stray who had already been through a lot of trauma. She arrived at the Humane Society with a large abscess on the side of her face. At first they thought it was caused by an impacted tooth and did surgery to fix that. However, the abscess didn’t go away. They found a number of thorns embedded deep in her ear canal. After a couple more surgeries they were able to clear those out. She was one sad pup. They had shaved half her face for the surgeries, so she was one pathetic funny looking pup. Wiggles spent most of her time with me recovering. Once she was off the pain meds, she perked up and loved going on walks. I was even able to get her to the groomer! Wiggles already had a line waiting of potential adopters, so once she was recovered enough to go, she went quickly. Moss was the next dog to come stay with us. He was wonderful, except that he has separation anxiety. After just a couple of days with us, he had to go back to the shelter. He needs someone to be with him and teach him that he won’t be abandoned. Freyja was an emergency pick-up, requested from a pug rescue in Phoenix. She is a great example of why I don’t foster puppies. Whoa. Non-stop whirling dervish pup energy. She even has a devilish look! She had been adopted and given up three times already in her eleven months on this earth, and no one had bothered to train her. She peed and pooped on everything (well, floors and carpet – not the bed, thankfully). Luckily, I only had her for three days before delivering her to the rescue organization in Phoenix. Whew. The Verde Valley Humane Society posted on their Facebook page asking for an emergency foster for an old, small, blind dog. He had been a stray, and ended up at the shelter. The original foster mom had to have surgery and was worried she’d trip over this little guy, so they needed to find a foster quickly. As you can imagine, he had difficulty getting around the shelter. His name was Elf and it suited him perfectly. A little, spritely pup, he may have been old, and blind, but he was nimble and perky. Elf was one of those dogs that cause foster parents to become “foster failures”. A “foster failure” is when the dog gets adopted by the foster people. He has an indomitable spirit and does not let his disability slow him down, except when it came to getting down off of things like chairs and beds. He even liked my motorcycle. I was very close to keeping this little guy. He stayed with us for about a month, when a women saw his picture on the shelter website and fell for him. She has a shy four-year old daughter and once they all got settled in Elfs new home, the little girl and Elf became inseparable. What better outcome could have happened? We are between foster dogs now, and I know that we are getting closer to being ready to adopt. Pugsly can ride along on the back of my bike, and my dream of having a sidecar rig and traveling around with my big dog is getting closer.